This post is sponsored by Purimania by Danna Banana; however, all opinions are the author’s. This post contains affiliate links. If you click through and make a purchase, Multicultural Kid Blogs receives a small commission at no extra charge to you. Every year we do our best to cover as many multicultural holidays in possible. As you know, next week, on February 28th, starts a Jewish holiday called Purim. 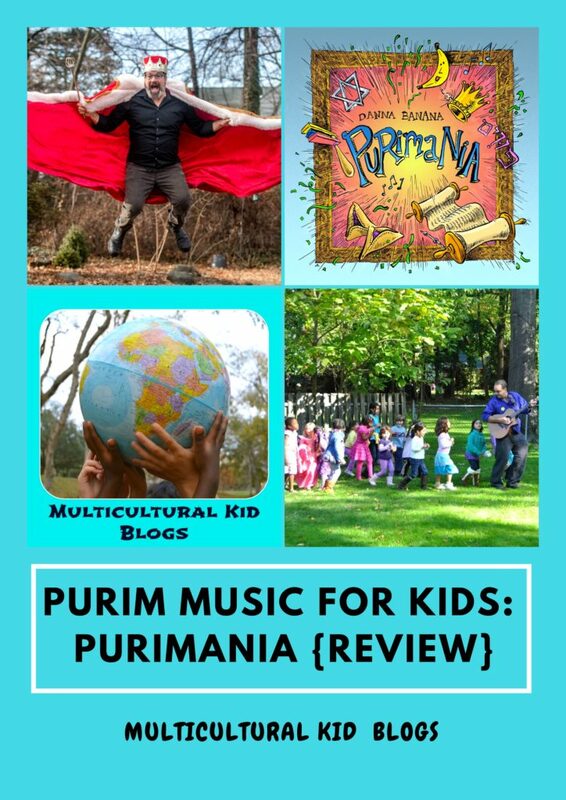 So today we are going to do a very non-traditional presentation of this holiday – through a beautiful and upbeat album of Purim music for kids called Purimania. Dan Cohen, known as Danna Banana, is a professional musician and singer who now writes songs for children. He is the creator of Bananukah!, the Goofball, and Suddenly Summer. He created Purimania as he felt there was a need for such a fun and upbeat way to present this holiday to children! Purim starts in the Persian Empire in the 4th Century BCE and the Jews were subjects. King Ahasuerus had his wife, Queen Vashti, executed because she didn’t follow his orders, so he had a beauty contest to find a new queen. A beautiful maiden named Esther became his new queen, but she wouldn’t tell him her nationality. During all this, a man named Haman became Prime Minister, and he hated the Jews. Esther’s cousin Mordechai, who was the leader of the Jews, refused to bow to Haman. Haman got very angry and convinced the king to kill all the Jews on the 13th of Adar. Esther had a feast prepared and invited the king and Haman. At this feast, she told the king she was Jewish. The king turned against Haman, and he was killed. Mordechai became prime minister, and the Jews were finally allowed to defend themselves against their enemies. All songs and tracks in the album are recorded in a way that they are entertaining, yet educational. This album of Purim music for kids is so fun that it can be used for a Purim party, or for daily dancing along the songs! My family is not of Jewish background but my grandmother grew up in a village where over 80% of population was Jewish. It is still a part of our family’s history, and I am very excited that I can share Purimania with my children. We have already read the story of Purim and this is a really lovely addition to it! I also recommend you to read The Queen Who Saved Her People: Book of Esther for Children (Arch Book) . It is a simplified adaptation of the Megillah Esther and filled with lovely images. And now, the exciting news! Today we are happy to offer you a chance to enter a Rafflecopter. Try your chance at winning one of two prizes: an Amazon US$25 gift card, and the amazing Purimania Album! Check the conditions below and we wish you good luck!